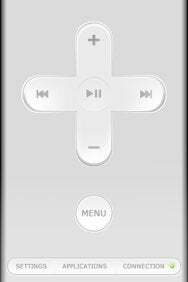 The Apple Remote Control, once bundled with a variety of Mac models, is now an optional $19 accessory. If you’re an iPhone or iPod touch owner who’d like to have that remote’s capabilities control of broader variety of applications and save $18 in the process, you owe it to yourself to check out Evan Schoenberg’s $1 Rowmote. Rowmote is an iPhone/iPod touch application that mimics the operation of the Apple Remote, complete with Plus, Minus, Back, Forward, Play/Pause, and Menu buttons. It works in tandem with the free Rowmote Helper application, which you install on your Mac. Once that application is installed it’s automatically added to your account’s list of login applications so that it’s ready to do your iPhone or iPod touch’s bidding even after you’ve restarted your Mac. Familiar Face: Rowmote’s interface is familiar to those with Apple's hardware remote. What makes Rowmote particularly special—other than that you don’t need line-of-sight access or you computer because it works over Wi-Fi—is that it supports far more applications than Apple’s hardware Remote Control. 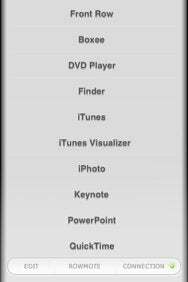 The list of supported applications includes Front Row, Boxee, DVD Player, EyeTV, Finder, iTunes, iTunes Visualizer, iPhoto, Keynote, PowerPoint, QuickTime, Plex, Skim, Spotify, VLC, Airfoil Video Player, PandoraJam, XBMC, and Last.fm. You choose an application by tapping an Applications button at the bottom of the screen. A Settings button to the left of that Applications button lets you choose the computer you want to control (you can control as many computers as have Rowmote Helper running on them). When you choose most applications, those applications will launch on your Mac (I say most because Rowmote wouldn’t launch PowerPoint on my MacBook Pro). Once they’re launched, you can control some or all of their functions, depending on the kind of application you’re working with. Regrettably, you can’t also quit an application with Rowmote unless the application has a specific quit command available via arrow-key navigation (as is the case with some media center applications). Speaking of media center applications, Rowmote is great with Front Row, Boxee, Plex, and XBMC, each of which is normally controlled with a keyboard’s Arrow, Return/Enter, and Escape keys. For this reason, it’s a useful tool for something like a Mac mini media center. Applications In Control: Here’s a list of Rowmote-compatible applications. When testing Rowmote, I encountered the occasional glitch where it would fail to recognize the Mac it was supposed to be connected to. This appeared to be a problem with the iPhone losing its connection to my wireless network rather than something caused by Rowmote. To help ensure against lost connections, Rowmote includes a Settings screen where you can enable a Stay Connected option (you can also enable an option that prevents the connected computer from going to sleep). These are handy options, but they’ll drain the iPhone or iPod touch’s battery more quickly. If you use your Mac as a media center—whether occasionally or full-time—or would like to easily control presentations from your iPhone or iPod touch, you should have this useful and affordable remote control. Rowmote is compatible with any iPhone or iPod touch running the iPhone 2.x software update.